Sometimes the best part about drawing a portrait is staring into the subject’s eyes. No exception in this case! Some of you who were with me in January may recognize this blast from the past. I re-drew him yesterday, and I’m more satisfied with the second attempt. I hope you enjoy it, too. Nicole’s husband, right? Nicely done. You know, she’d be a terrific subject too. I kept seeing her in my portrait of Grace Kelly. Didn’t she play her in a film? I don’t follow film all that much, but they do look pretty similar. Her eyes are amazing as well. Yes she has a very distinctive look. I would not call it beautiful, it’s less “classic” than Grace Kelly. I don’t watch movies that much either, so I don’t know that much about her films. Yeah, more intense than beautiful, I’d say. I agree, not the classic look of Princess Grace, but she’d be fun to draw, I think. I think so too. Add her to the list! You got the First Guessed award today! Man, some of you are up pretty early in the morning lol. I sometimes check the phone, then go right back to sleep (which is pretty much the way it went today). I spoke too soon, and my foggy brain, mema beat you to it by a few minutes! lol no worries, no portraits on the horizon w my work schedule this week. Pressure’s off lol! Thanks so much, Sharon! You guessed it! That’s a fine portrait. I don’t know his name. I’m glad you enjoyed it! He was a pleasure to draw. Amen and pass the sauce! Thanks! Oh my, it has to be Keith Urban? That’s right! :))) The one and only! And your quote never became so apparent until I started drawing portraits. Woo! 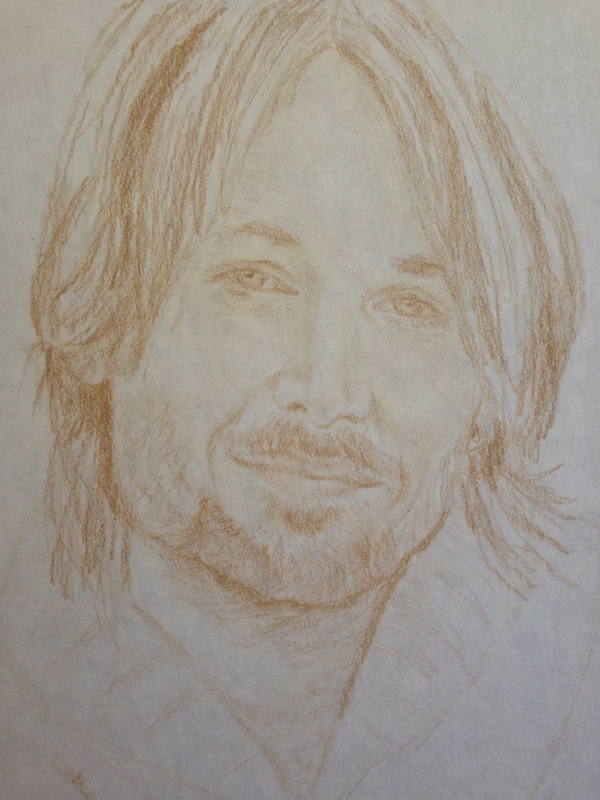 Keith Urban, I think? Great drawing! Thank you very much!! You guessed it!! Nicely done. Really good. Is it Keith Urban? You got it! Thank you very much! The husband of a famous actress, can’t remember their names… Very nice portrait!! !